M, TH: 8:00 a.m. to 7:00 p.m.
T, W: 8:00 a.m. to 6:00 p.m. 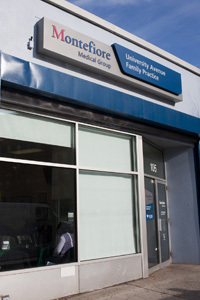 Sat (1st and 3rd): 9:00 a.m. to 1:00 p.m.
University Avenue Family Practice is one of the MMG sites that is a member of the Bronx Community Health Network (BCHN), a Federally Qualified Health Center (FQHC). BCHN-sponsored FQHCs provide access to affordable, quality, comprehensive health care including dental, mental health, social work, nutrition, health education and pharmacy services. A team of healthcare professionals work together to offer an integrated system of care that ensures collaboration among all of a patient’s medical providers. No one is refused care because of inability to pay. Learn more about BCHN’s mission and its member health centers.